Cutloose Climbing: Ard Ay gets 9th ascent! 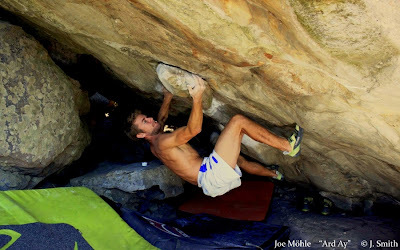 Joe is more known amongst the climbing circles for his trad climbing prowess, but this season he's set on making a mark on the bouldering front as well. Joe first tried the problem in 2006 figuring out all the beta, and had tried it on and off over the years with varied degrees of seriousness. About a month ago, however, he decided to tie up this loose end and dedicated his next five or six sessions to the line, with success finally coming on this cool autumn evening.